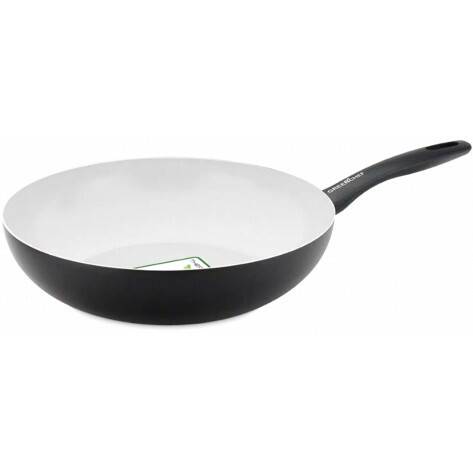 The GreenPan GreenChef Everyday Wok; the GreenChef Everyday Value collection in eye catching dove grey aluminium is your everyday cookware value go-to. The GreenChef in one word? Handy! These lightweight pots and pans have a solid base which offers good heat distribution and guarantees stability. In addition, the Thermolon ceramic non-stick coating makes cooking easy and the ceramic aluminum body makes cleaning a breeze. Roasting, braising, making sauces: In contrasting black and cream it is your ideal helping hand in the kitchen!